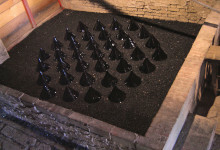 “On a four meter long shelf is a geometric frieze made with conical, black ceramics. This conical form was inspired by a variety of Moroccan objects like the tagine dish, teapot, breadbasket, babouche, etc. 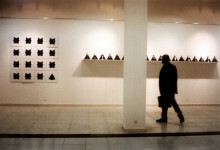 The form repeats itself along the shelf with an autonomous rhythm while drawing a black frieze through the white space of the gallery.